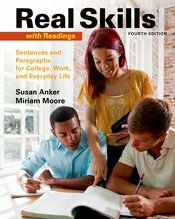 Real Skills with Readings offers practical, accessible coverage of basic sentence skills and step-by-step guidance for writing paragraphs. Motivating students with its message that writing is an essential and achievable skill, the text uses real-world examples, assignments, and readings to help students relate writing to all aspects of their lives. The fourth edition builds on suggestions from developmental writing instructors across the country. Streamlined with a new design, the text features even more emphasis on critical thinking and reading skills, with new guided reading support in every chapter and more samples by real student writers. Additional skill-specific practice is available by packaging Real Skills with LaunchPad Solo for Readers and Writers, our newest set of online multimedia content and assessments, including LearningCurve adaptive quizzing. Use ISBN 1319051928 to order Real Skills with Readings and LaunchPad Solo for Readers and Writers.